No drilling! Install suction grab bar in minutes! This grab bar installs in just minutes with no drilling required. 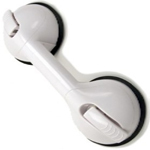 Need a grab bar when you are travelling? Easy, just take the Quick Bar with you. Red and Green Safety Indicators on the ends of the grab bar will tell you if you have a achieved a good (safe) suction seal. These indicators will change from "red" to "green" when you have a good seal and the Quick Bar does not need to be repositioned. Simply change the position of the grab bar until the indicator is "green." The Quick Rail 350 has soft grip pads on the backside of the bar, where your fingers touch when grasping the bar. The top side of the bar has a pebble texture for a non-slip grip. This line of safety grab rails are constructed of engineering grade polymer resin and non-marring suction cups. The Quick Bar grab rail can be used on any smooth, non-porous, dry surface such as tile, fiberglass, glass, porcelain, and some plastics. It is not for use on painted, papered, wood or embossed surfaces. It cannot be installed on moving surfaces. The grab bar cannot be placed over grout lines! 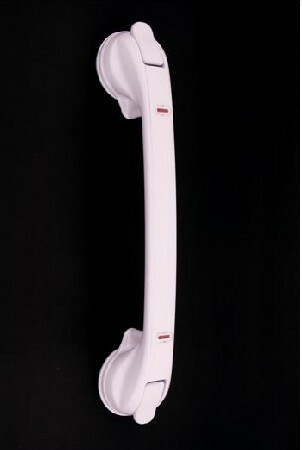 The Quick Rail Grab Bar is not designed to hold or support your full body weight and is intended for support only.